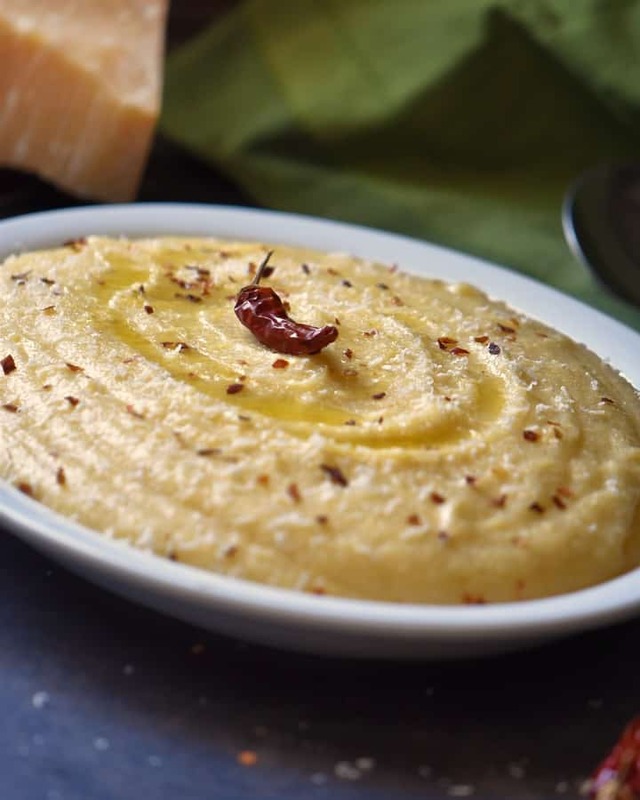 Home » Side-Dish and Vegetables » Creamy Polenta Recipe -So Easy! Polenta, a classic example of Cucina povera. As you probably know, this can literally be translated into poor kitchen, that is to say, peasant food. So many creative recipes made out of necessity because of poor economic conditions that existed in different regions of Italy. Cacio e Uova and Pasta and Lentils are two other examples of peasant dish recipes. Fast forward to today, where polenta is used as a base to create appealing dishes in upscale restaurants. 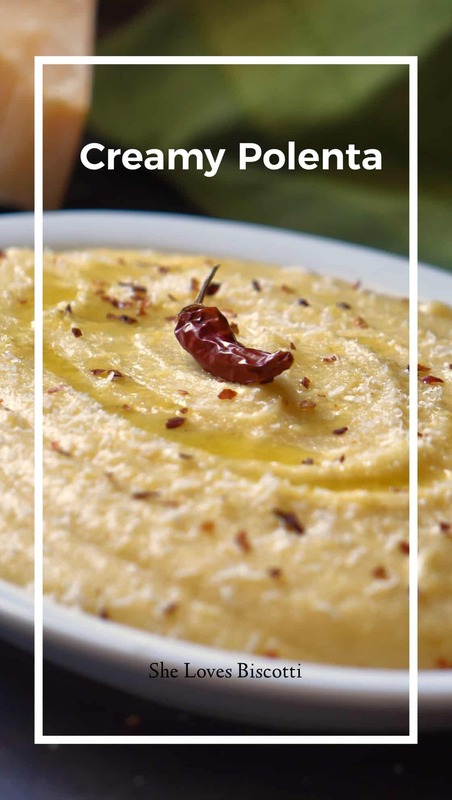 Let’s take a closer look at this easy polenta recipe. 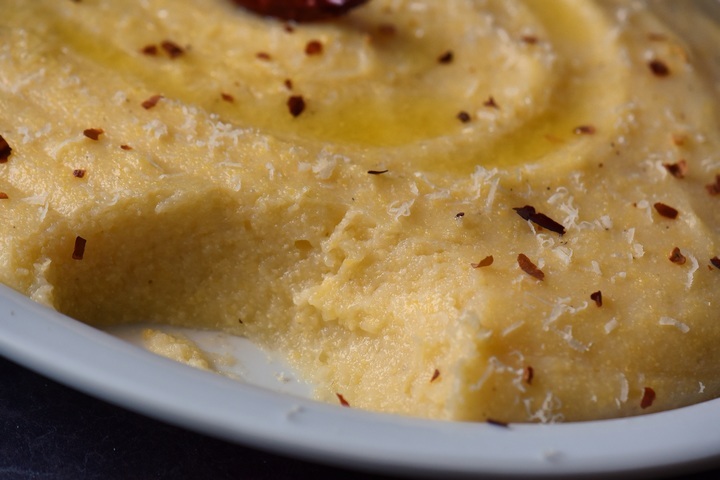 Polenta originally referred to any grain or pulse cooked to the consistency of porridge. Today, polenta usually refers to a dish made from maize flour, cornmeal. Is polenta hard to make? Although cooking polenta is very easy, there is a time investment of 45 minutes. This is the time required for the cornmeal to soften once combined with the water. At the end of this process, the texture of the cornmeal is transformed from gritty to silky. The only way to achieve this is for the cornmeal to become properly hydrated. In order for this to happen, it takes a bit of time and a lot of stirring. 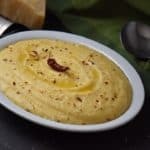 What do I need to make this Creamy Polenta Recipe? Cold water. If you prefer can also use a combination of stock and/or milk. Salt. According to your preference. Cornmeal. Both coarse and finely ground. Parmesan cheese. Optional, but always appreciated. Olive oil. Optional, but the fruity undertones are great with this nutty whole grain corn. In order to create this magical food, you will need a stainless steel pot, a whisk and a wooden spoon. That’s it! Over medium-high heat, bring 7½ cups cold water and 1 teaspoon of salt to a boil. Use a large, heavy bottomed stainless steel or copper saucepan. While waiting for the water to boil, whisk together the coarse and finely ground cornmeal in a small bowl. Combine 3/4 cup of each. Reduce the heat to low as the cornmeal will splatter when added to the water. Add the cornmeal slowly, in a thin steady stream, while whisking constantly. Adjust the heat in order to get the polenta to bubble occasionally. 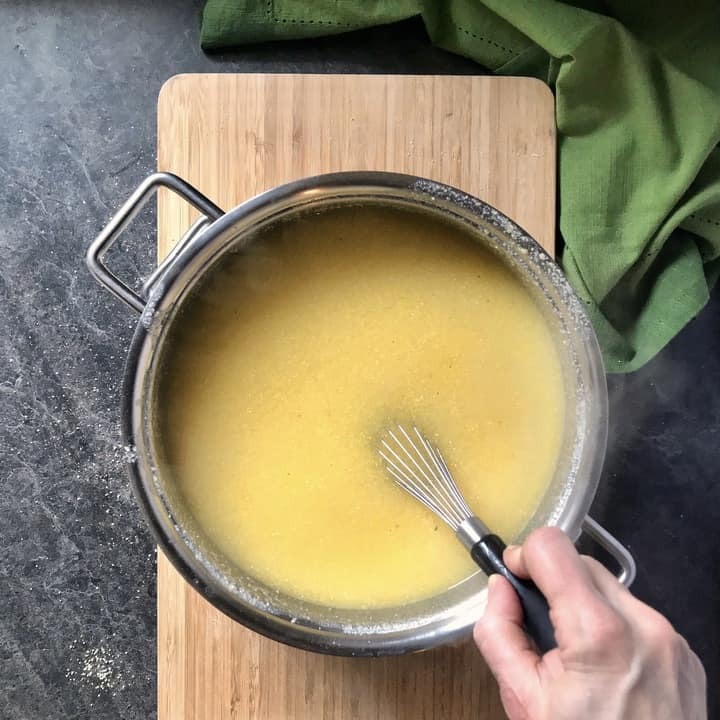 Start by whisking, then use a wooden spoon and stir continuously for about 35-45 minutes until the polenta is smooth and thick. 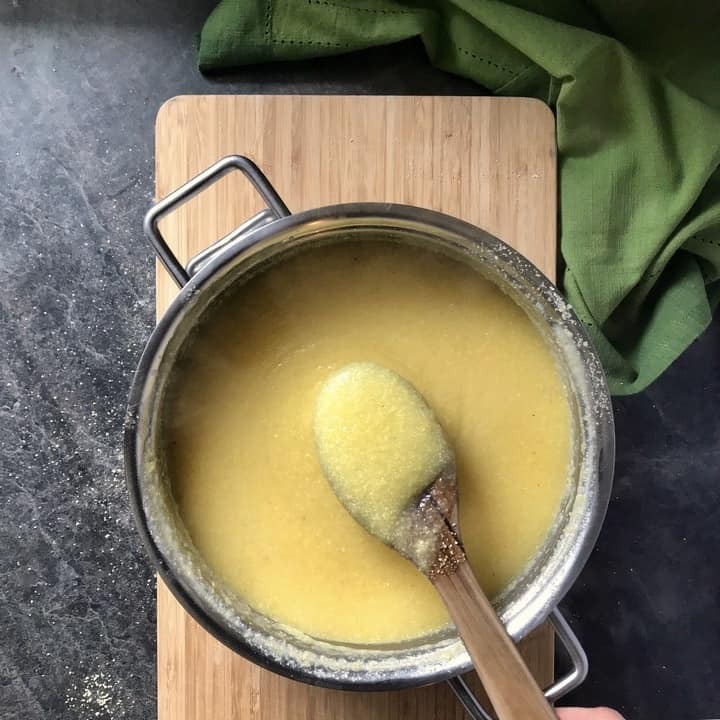 If lumps form, press them against the side of the pot, smash them with the back of the spoon and blend with the rest of the polenta. Add 1/3 cup of Parmesan cheese, stir to combine. Serve immediately. If desired, garnish with more grated cheese and drizzle with olive oil. This Italian polenta can also be refrigerated, sliced, and pan fried, grilled or seared. Although polenta can be made with either coarse or fine cornmeal, a combination of both provides the silkiest texture. DO NOT use instant polenta for this recipe. Add the polenta slowly, while whisking, to the boiling water in order to avoid getting lumpy polenta. As the polenta cools down, it becomes firmer. Polenta can be kept refrigerated for up to 5 days. Can I double the recipe? 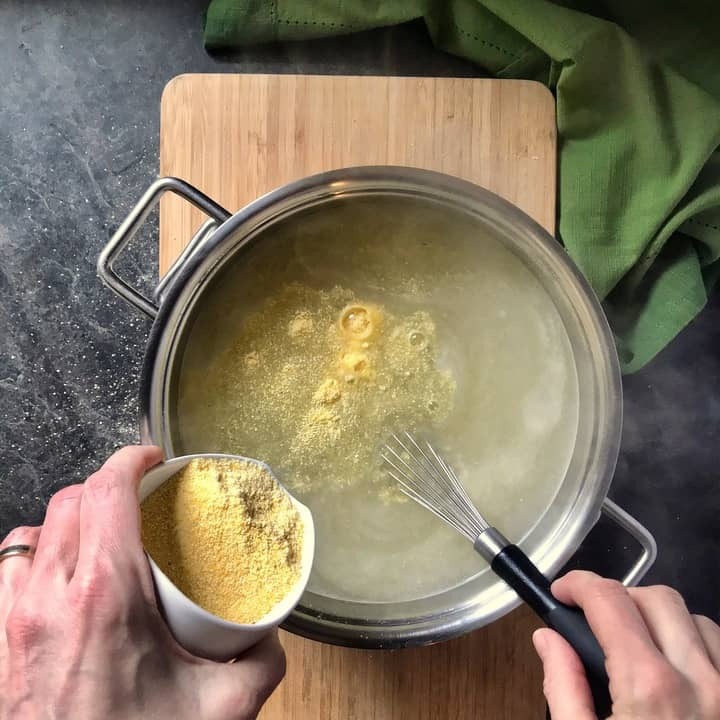 Yes, in fact as long as you keep the ratio of 5 cups of liquid to one cup of cornmeal, you can increase (or decrease) the ingredients accordingly. Use caution with salt. Did you know? According to America’s Test Kitchen, they suggest adding a pinch of baking soda along with the salt to the boiling water. 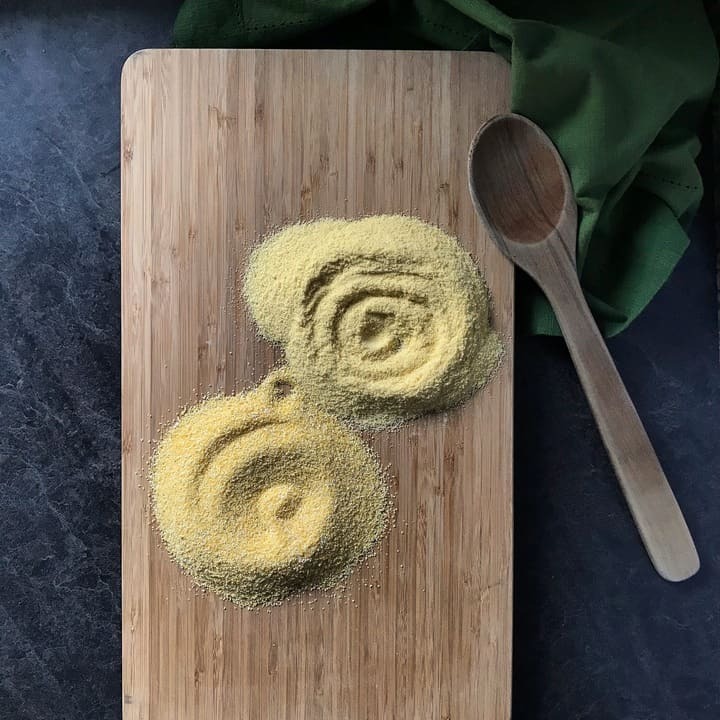 This simple addition will break down the cellular structure of the cornmeal molecule and therefore reduce the total cooking and stirring time. Although I have no doubt that this will work given the source, I will stick to my family recipe. It’s back to my childhood for this recipe. There were never any complaints at the supper table when my mom would make this dish. She would always serve it along braised or roasted meats. Polenta is also a great base to serve with ragù. My mom was very creative with her polenta dishes. In fact, my mom was making Polenta Pizza even before it was a thing. Being creative with polenta is easier than you think. Take a look at this Asparagus Ricotta Tart with a polenta crust. The perfect addition for any brunch occasion. No matter how you serve this creamy polenta with cheese, one thing is for sure, it is the perfect example of Italian comfort food. 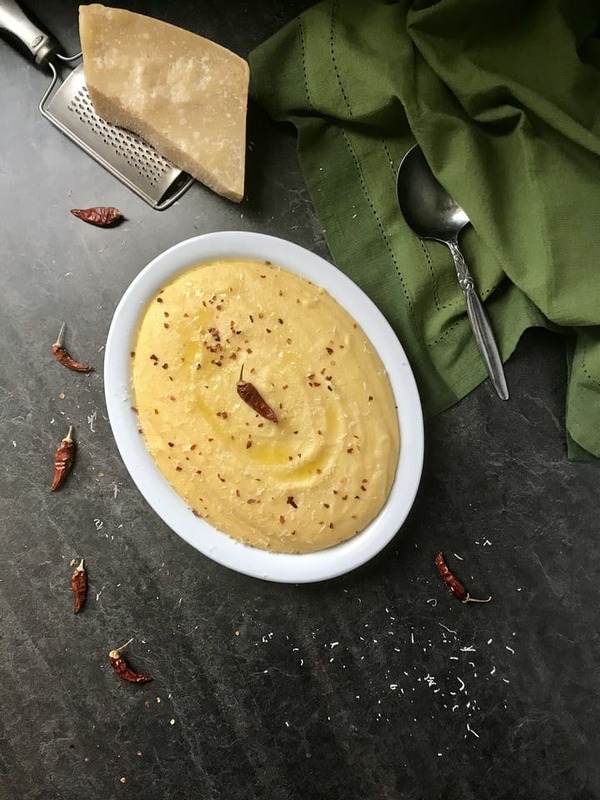 ★★★★★ If you have made this Creamy Polenta recipe, I would love to hear about it in the comments below and be sure to rate the recipe! 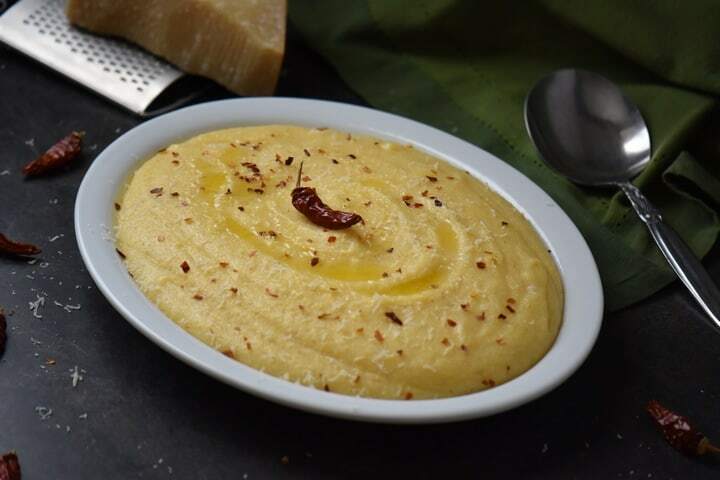 You won't believe how easy it is to make this Creamy Polenta Recipe! Sprinkle with cheese, drizzle with olive oil, garnish with your favorite sautéed vegetable or leave as is… any way you have it, you will love this traditional Italian food. Over medium-high heat, bring water and salt to a boil. While waiting for the water to boil, whisk together the coarse and finely ground cornmeal in a small bowl. Reduce the heat to low. The cornmeal will splatter when added to the boiling water. While constantly whisking, add the cornmeal slowly, in a thin steady stream. Adjust the heat so that there are just a few bubbles breaking the surface. With a wooden spoon, stir continuously for about 35-45 minutes until the polenta is smooth and thick. Even if it takes 45 minutes, I think my family would love this! I’m always looking for recipes for us to try. Doing the same old line up is getting boring. This seems like the perfect thing to try. Thanks so much Danyelle. Hope you get a chance to try it.Thanks for stopping by! I love polenta! This is the best recipe ever… thanks! Thanks so much Val! I’m glad you enjoyed this creamy polenta recipe.